Popular cgminer 3.7.2 is not supported due to the bug in the code. You have to use newer miner. So does this work? I’ll try and see. Ok so I installed the WinUSB over the STM32 Com driver, but now it just keeps saying “Stratum from pool 0 requested work restart”. Finally, I got it to work. I had to run cgminer, unplug the USB cable. 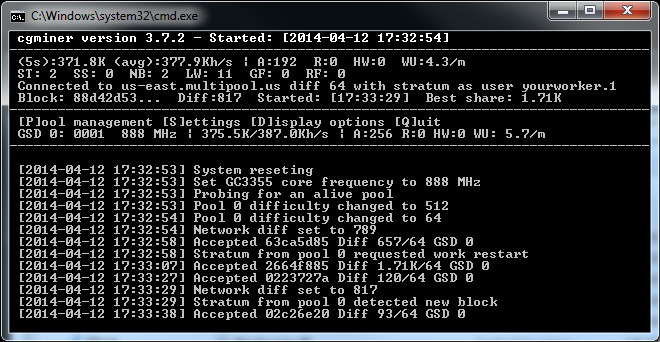 Plug it back in, restart cgminer and boom it works. I use this version to correctly display hash rates on my blades then I have a separate RBP to run my 5 chip singles. I know you can set it to 40 chip or 5 but as far as I can tell you can’t do both or set it per serial number like you do speeds. It would be great to be able to and I could literally just run them all together. I do know they will run together and work fine according to the pool rate but I’d like it to display correctly all together in cgminer. Just keep in mine if the dev sees this. Hi, I am using some Gridseed 5’s. I can not change the frequency via the bat file parameters. It makes no difference if I put in 600 or 1350. Is there anything around that allows me to change the frequency while I am in DUAL mode mining? I give up.. this is a hopeless machine and clearly flawed. I cant seem to get more than 4 blades running? I’m in trouble. Please help me. Thank you. When solo A coin, the cgminer works fine.